One of our new books, All About Me! is filled with simple, creative ideas to help you learn more about your Pre-K or K children and allow them to learn more about themselves. The author, Brenda Strickland, has been teaching a classroom filled with enthusiastic preschoolers for many years and every activity in her book is one she has done with her students. They work! Luckily, my grand kids came by to help me try out a few of the activities in the book for you. Colton just turned four and Shelley will be six next week. We decided to make the “fancy” nameplates first. It was great way to explore the shapes of different letters. I know, you’ve probably seen Pasta Makes Perfect before, maybe even many times before. But if you are four, it is a big deal to get to use glue and different colored art materials (just like the big kids), and there is a lot of eye-hand coordination involved—as well as learning the letters of your name and your classmates’ names. We used tri-color pasta, but sequins, beads, or buttons will work just as well. The more colors the better! We gathered glue, cardstock, and a clean, damp sponge so that they could periodically wipe the glue off their fingers if need be. Some children don’t mind getting gooey, but for others it is a big deal. 1. We started with good-sized nametags. I wrote their names and left a little extra space in between each letter. I think I should have left a smidge more. Pasta takes up space! 4. It is best to add the pasta one letter at a time. 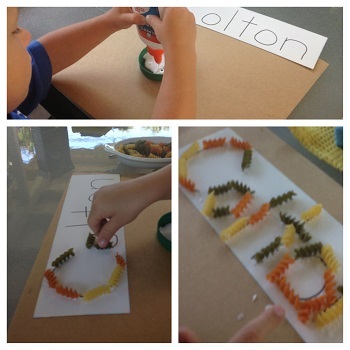 We found that the smaller, broken pieces of pasta were great for rounding those curves on some letters! 5. Finally we let the glue dry completely. It has to be invisible (clear) before you can pick up your name! Did you know it feels different to trace a “pasta letter” than a felt pen letter? Next, we decided to work at the easel and play Roll-a-Body. We took turns doing individual drawings but this can be done with a partner or in a small groups, too. The key is to have someone who can read and help with counting the dice. In our case, Shelley read to Colton, and grandma helped add the dice. Teamwork! Roll two dice and add the totals. 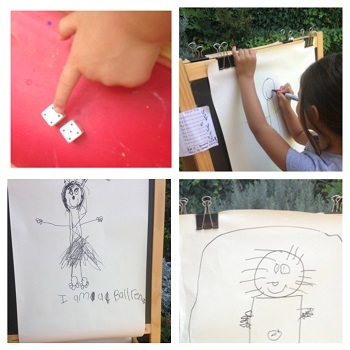 (Children who are waiting for their turn can practice rolling and adding dice.) We counted the dots on each die and then tried to add them, 4 + 5 = ?. If we didn’t know the totals, we went back and counted all the dots on the two die to get our total. Next we checked our list to see what we were supposed to add to our drawing. Shelley rolled a 5 and added hair, a 4 for a mouth, 6 for arms, and then 8 for hands. Then a 9 was rolled. Nine was tricky because we had to figure out where to draw the feet before we had legs since we hadn’t rolled a 7 yet! Good time for a little critical thinking practice. Hmm…how far down should we put feet. We kept rolling until we had added all pertinent body parts and then added a tiara instead of a hat.It was a ballerina after all. Colton, too, finished his “roll-a body.” Since his feet were wearing swim fins, he added a pool! There are many more wonderful activities in All About Me! Hope you will try them out.